Details: Relatively few Ford Focus estates have been added to the central fleet over the past year, the preference seeming to be for larger vehicles like the Peugeot Partner, Citroen Berlingo and Renault Kangoo. There was also a sole Skoda, perhaps for evaluation. 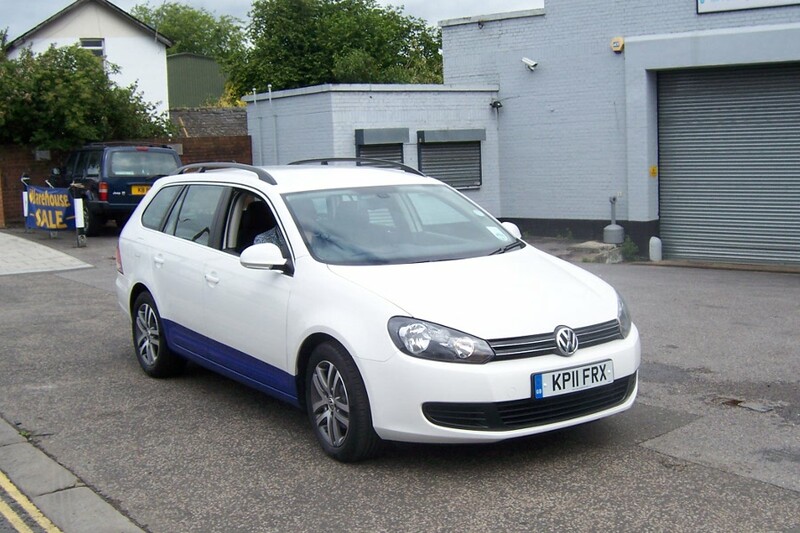 From spring 2011 a number of Volkswagen Passat estates were delivered, this type having latterly been very rare as a service vehicle. Ray caught two Passats being delivered to Acton Works on 13th June 2011. Both wore unmarked white/blue livery but will presumably appear with lettering and fleetnumbers in due course. KP11FRX paused on Bollo Lane before heading into the works, allowing this photo to be taken. I've just noticed that the Skoda Octavia and the VW Passat are very similar, probably sharing major components.